Marc Gasol came to the Toronto Raptors as a result of a trade at the deadline. The trade sent Jonas Valanciunas, Delon Wright and a 2024 2nd round pick to Memphis in return for the former DPOY. Gasol isn’t the same player that he used to be in his prime, but he is still a valuable addition to the squad. Marc Gasol has plenty of experience in the playoffs, being a part of the Grit and Grind Grizzlies who were always contenders in the West. The allure of Marc Gasol is clear: he has the tools of a traditional big man, while also having valuable assets for today’s game: 3 point shooting and passing. Serge Ibaka has been with the team since the 2016-2017 season, after he was traded to the Raptors from the Orlando Magic. The Magic received Terrence Ross and a 2017 first round pick. What the Raptors thought they got in return, was a floor spacing PF who could also protect the rim. However, while Serge is able to somewhat space the floor and shoot the three, he struggles against faster guards on the perimeter. 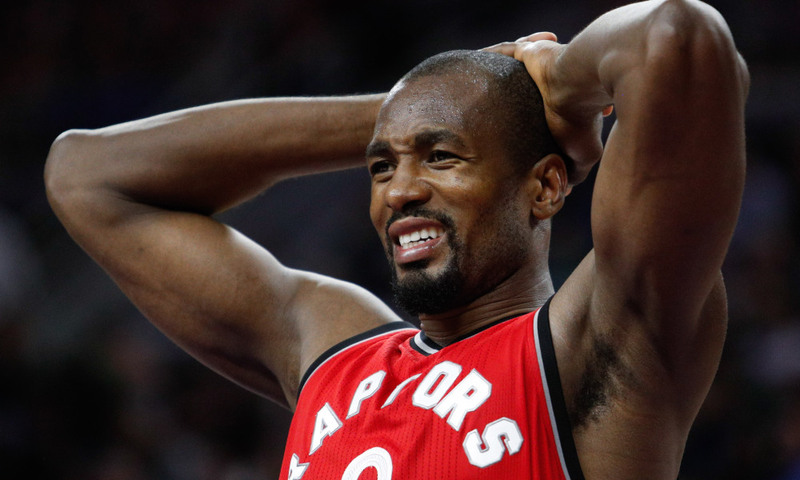 Serge Ibaka was put into an uncomfortable role within Dwane Casey’s offense, and he simply couldn’t do what was asked of him, since it wasn’t his role. This year however, Serge has been playing better as a small ball center. How will our duo of centers do this year? Let’s go ahead and think about it. Last year in the playoffs, Serge Ibaka wasn’t good. Expected to be the 0.5 of the Big 2.5 the Raptors had, Serge’s output simply didn’t match that role. Blame it on his misuse by Dwane Casey. At the start of the season Nick Nurse switched his position to center. Ibaka at Center led to a resurgence in Serge’s career. Ibaka is averaging 15.0/8.1/1.3, shooting 52/29/76. He is now able to get better looks in the post and create for himself, instead of being a spot up shooter. Serge started for most of the season. Valanciunas was an offensive machine. However, Ibaka got the nod at the starting job due to JV’s porous defense. The only time JV would start is when the matchup dictated it which meant match ups against traditional centers like Drummond or Embiid. If you look at the box score,Gasol isn’t as good of a scorer or a rebounder as JV. His box score stats aren’t anything special: with the Raptors he’s averaging 9.0/6.7/4.2 on 46/44/76. Despite his “lowly” box score stats he is 3rd in assists on the Raptors behind Lowry and VanVleet. Gasol is the secondary quarterback creating looks for the team. Gasol has been starting recently, after coming off the bench for a portion of his time here. While traditional box score stats don’t favor him, a look at the team’s statistics post all-star break speak volumes. The Raptors have been moving the ball well and making the extra pass, and it’s no surprise that their three point shooting has become elite: 41.5% on 35 attempts post all star break. Gasol’s passing and mentality is paramount to the Raptors success in the post season. Ibaka can shot block well and is more athletic and mobile, with worse shooting and passing than Gasol. Serge Ibaka’s a small ball center in the NBA. In the playoffs that suggests that he will start against players like Al Horford who can slot into the 5, but have the size of a 4. Ibaka could also get huge minutes against teams with two traditional bigs on their roster, like the Pistons (if they play us). We would need both Ibaka and Gasol against a team with a twin-towers line up, as Siakam is still too lanky to guard someone like Blake. Same would go for a big like Embiid. Ibaka can body up against larger bigs, but also maintain a semblance of defense against some guards. Marc, on the other hand, is a true stretch 5. Shooting the three a staggering 44% with the Raptors on 2 attempts, Gasol has done what JV and Ibaka could not. Ibaka is an amazing small ball 5, but his shooting and passing aren’t up to par to be a spot up stretch 5. Gasol possesses both those things, and his 3 point shooting is elite for a 5. I don’t expect him to be a primary scorer these playoffs, but sometimes you just need a bucket in the post. Expect Marc to keep a similar role within the offense with more shots coming in the post when things get rough. The fact that Toronto has stretch 5s for 48 minutes of every game is a luxury most teams don’t have. Ibaka is a starting caliber center coming off the bench. I do think that Marc gets the start with the starting line up. The starters don’t need more scorers: they need to make sure that their scorers get open shots. Kawhi and Pascal can handle the scoring, they just need open shots: a lot of which come from transition. Marc Gasol makes great long passes, and always finds the open man. There are no delays in his passes either. He is an instant open man finder. Marc Gasol starts most of the time, barring injury. Marc Gasol is a great center, and better on defense than JV. Better however doesn’t mean stellar. Gasol was matched up against Al Horford in the Raptors last game against Boston. Now, Al Horford didn’t have a great game. Most of the Celtics didn’t that game. Despite that, Horford was open for a lot of threes. A lot. Serge Ibaka keeps up better with the faster centers of the league and should start against small ball lineups. Also there’s one thing about Serge: if he gets hot he’s unstoppable. If he has the hot hand, there is nothing stopping him from getting his buckets.